This has quite a few vegetables so just has to be healthy. If you are looking for a quick lunch, or even dinner, that is full of flavour but not full of fat then you can’t go past this salad. The beef is very tasty even though it takes only minutes to marinate, and the fried noodles add a great crunchy texture to every bite. I made my dish very mild but if you like it spicy then use an extra red chilli and/or leave the seeds in rather than removing them. If you can’t get wombok (chinese cabbage) then you can also make this using Iceberg lettuce instead. In the usual spirit of my recipes, feel free to substitute chicken or pork strips if you don’t have any beef. Mix together the ginger, soy sauce, fish sauce, lime juice and sugar in a medium glass or ceramic bowl. Add the beef strips and stir to coat in the marinade. Set aside for 5 minutes. Heat the oils in a wok over a high heat, then add the garlic and cook for a few seconds or until fragant. Add the beef, any excess marinade, capsicum (bell pepper), carrot, and chilli to the pan and stir fry for 3-4 minutes or until the beef is cooked through. Add the coriander to the wok and toss to combine. Remove from the heat. 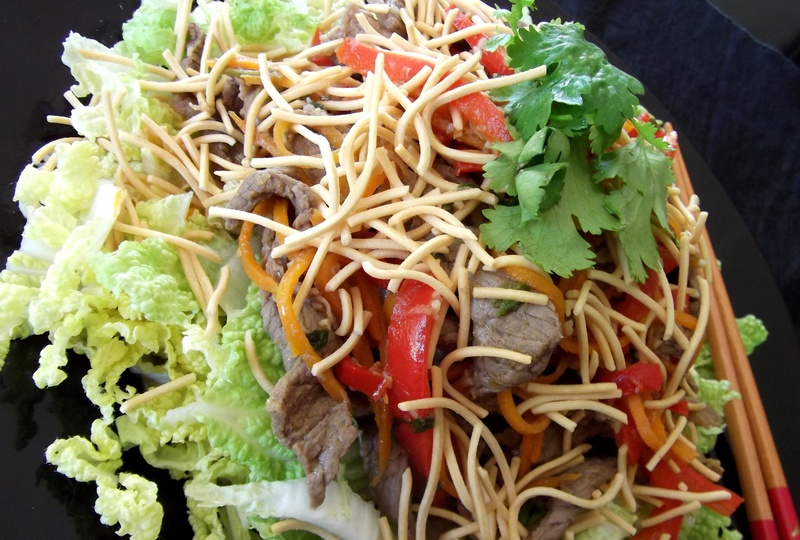 Place the shredded cabbage on your serving platter, then pile on the beef stir fry (including the sauce). 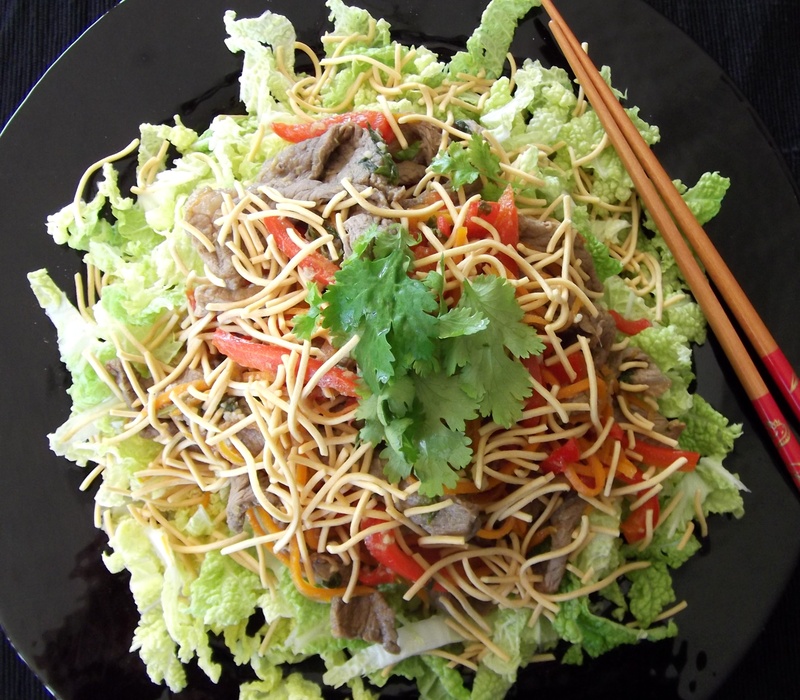 Top the beef with the crunchy noodles, then scatter over a few coriander leaves. 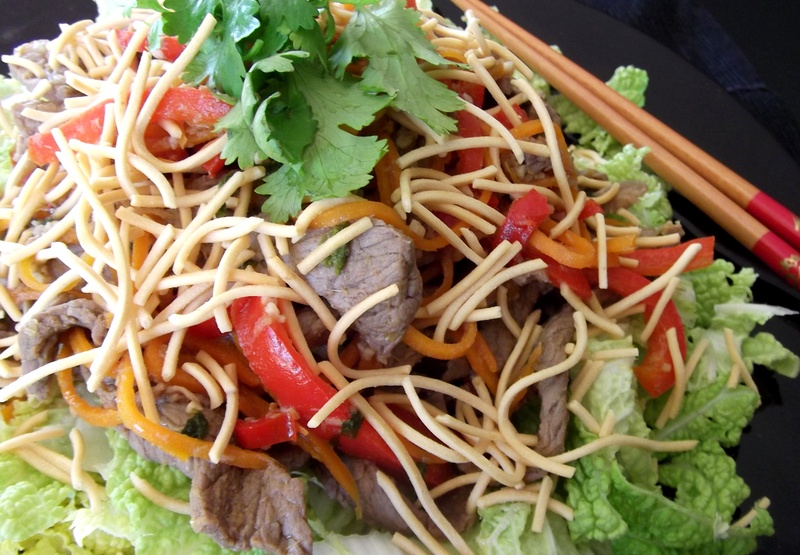 This entry was posted in Mains and tagged Asian, Beef, Food, Light meals, Lunch, Noodles, Recipe, Recipes, Salad, Thai, Vegetables. Bookmark the permalink. Im having a hard time finding the noodles! Where do you buy them? I have seen/bought them from a few Woolworths supermarkets around Perth, but if you are in a different part of the world then you may need to try an Asian store or market. Hope you find them.